Mix up a homemade foot soak for a complete salon experience. If your biweekly trip to the salon for a pedicure isn’t in your budget anymore, your toes don’t have to suffer along with your wallet. Get a pedicure at home for a fraction of the cost. But to get the real salon experience, you have to start with a foot soak. Relax, kick back and soak your feet, and let the water soften the dead skin cells so you can exfoliate your tootsies. Give your feet a rest after you whip up a spa-worthy soak for your at-home pedicure. Fill a basin or tub with enough warm water to completely cover your feet. Add a few drops of tea tree oil, 1 teaspoon of witch hazel, 1 cup of warm milk and ½ cup of Epsom salts. Tea tree oil is an antifungal and will get rid of bacteria, and witch hazel also fights bacteria while reducing swelling and repairing broken skin. Milk in a foot soak replenishes dry skin and reduces irritation, and Epsom salts exfoliate and rejuvenate the skin. Toss in three to five drops of essential oil like rosemary, peppermint or lavender to add a nice scent. Soak your feet for 10 minutes. If your feet are especially dry or rough, soak for an addition 5 to 10 minutes to effectively soften rough skin. Take your feet out, and pat them dry with a towel. Buff your feet with an exfoliating sponge or scrub. Rinse and pat your feet dry. Put a handful of marbles in the bottom of the basin as you soak your feet. Move your feet back and forth over the marbles to massage your feet as they’re soaking. 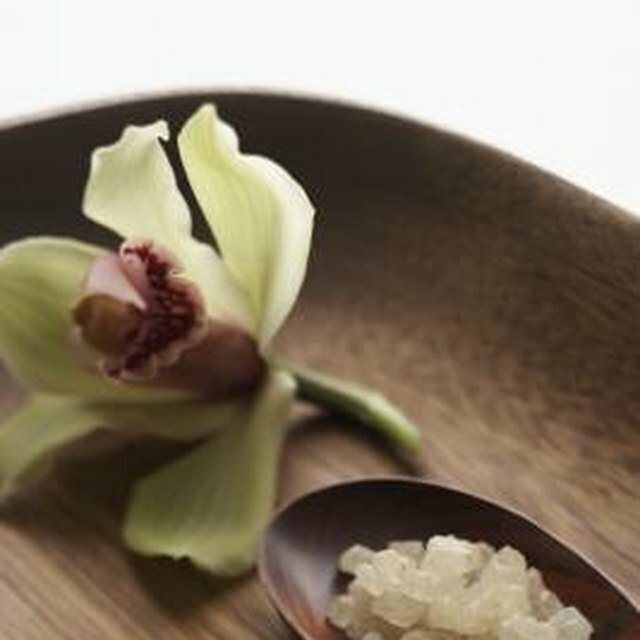 If you don't have essential oils on hand, work with what you have at home to add a refreshing scent to your foot soak. Put a few lemon, lime or orange slices in the basin, add some fresh mint leaves or use vanilla, almond or peppermint extract. Customize the foot bath to suit your own preferences.